HERE YOU WILL FIND SOME SUGGESTIONS ON WHAT TO SEE IN THE MARCHE: FROM THE SEA TO THE MOUNTAINS, FROM THE HILLS TO THE VILLAGES. CULTURE, FUN, ENOGASTRONOMY, NATURE, RELAXATION: EVERY DAY YOU CAN CHOOSE THE VACATION YOU PREFER! The first written document mentioning Monte San Vito dates back to 1053. The Municipality counts approx. 6800 inhabitants and offers everything for daily needs (grocery, pharmacy, butcher, bakery, pizzeria, restaurants, bars, hairdresser, bank and post office). The historic village is just an 8-minute walk away. The adjacent town, Chiaravalle, is 5 minutes by car. Monte San Vito is located in the territory producing the ancient native vine called “Lacrima di Morro d’Alba” with a ruby red color with persistent aromas of cherry and plum, with rose and violet aromas. Other prestigious regional wines are Rosso Conero or Verdicchio. In the vicinity you will find several wineries, such as the Antica Cantina Sant’Amico, where you can book tastings. Besides, Monte San Vito is located in a region of olive and artichoke cultivation, such as the early artichoke of Jesi. Both crops are present in our company. The village of Monte San Vito, as well as the surrounding municipalities, organizes beautiful traditional festivals. The best known is the Beer Festival which annually takes place at the beginning of September in the historic center. The proximity to the Adriatic coast also invites you to spend pleasant days at the beach. Several beaches along the coast offer the most varied possibilities. Whether it is a simple walk on the soft beach of Senigallia or, if you prefer a pebble beach and cliffs you will find everything at a distance of 10 – 20 minutes by car in the beautiful Riviera Del Conero. 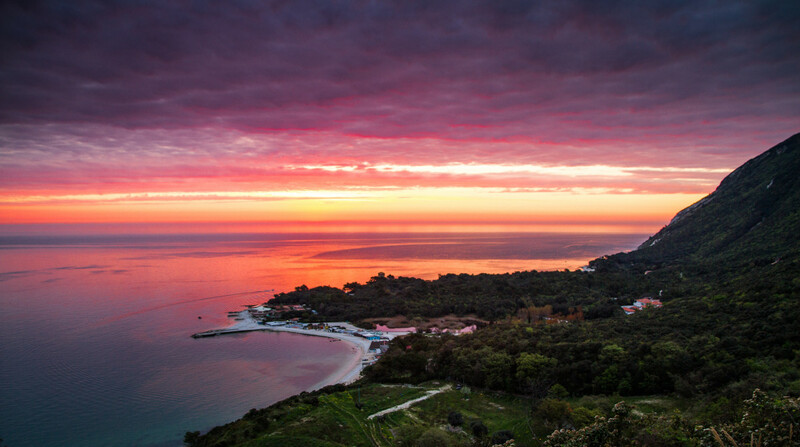 The Bay of Portonovo, with the Napoleonic fortress, the beach of the Two Sisters that recall the Faraglioni of Capri, the beaches of Numana and Sirolo. The Riviera, as well as the beautiful park, are conveniently reachable by bus (Conerobus). Just 17 minutes by car is Ancona, the capital of the Marche region, with its extraordinary port. Founded in 387 BC, the city has always been an important port city and even today the city enhances the splendor of those times. The beautiful old town with all its restaurants, bars and shops is very welcoming. Daily ferries leave for Greece and other destinations. Ancona has an international airport too. The quarantine island Lazzaretto, a also called Mole Vanvitelliana, built in 1732, is a pentagonal building built by the famous architect Luigi Vanvitelli. Among other things, it was used to safeguard public health by hosting deposits and housing for quarantined goods and people. Now the monument is used to host temporary exhibitions and other cultural events. Part of it houses the Homer Tactile Museum. The Arch of Trajan was built around 100 AD. to honor the emperor Trajan and was the ancient access to the city. The Cathedral of Ancona is dedicated to San Ciriaco and is the metropolitan cathedral of the archdiocese of Ancona-Osimo. The cathedral is a high example of Romanesque art. San Ciriaco boasts one of the oldest domes in Italy. The view from the cathedral on the port of Ancona is spectacular. 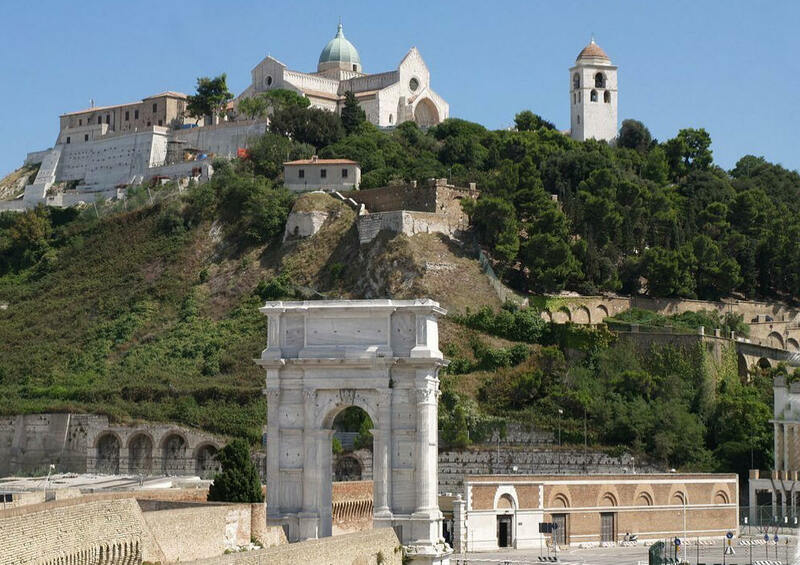 Other places to visit in Ancona: Church of Santa Maria della Piazza, Monument to the Fallen, Piazza del Plebiscito, Caves of the Passetto, Teatro delle Muse. The city of Jesi, founded by the Greeks in 768 BC preserves an elegant historic center with interesting monuments and museums. On December 26, 1194, Emperor Frederick II of Swabia was born in Jesi, to whom is dedicated the most important square and the innovative Stupor Mundi museum. The medieval soul is breathed throughout the village, and especially in the early days of May during the Palio of Sain Floriano, 4 days of historical re-enactments with figures in ancient costumes, taverns and music. An important industrial and commercial center (to be nicknamed the small Milan of central Italy), Jesi is also the land of Verdicchio, a famous white grape vine cultivated in the hills of the River Esino valley. Jesi is just 15 minutes from Monte San Vito. 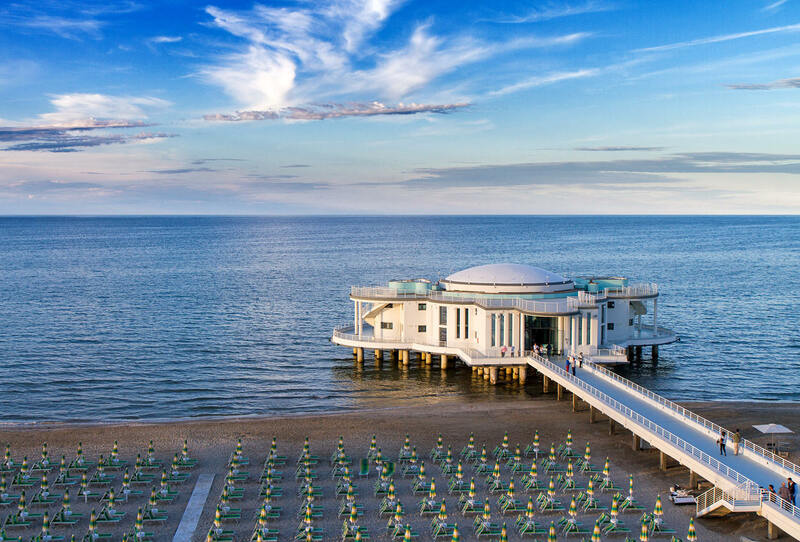 Senigallia is located north of Monte San Vito (20 minutes by car). The Fortress of Senigallia, also known as Rocca Roveresca, is one of the most important monuments of the city. Every year takes place in Senigallia the Summer Jamboree, an international event that plunges the city into the atmosphere of the America of the ’40s and ‘50s, with concerts, parties and swing dance. The beach that borders Senigallia is known as “the velvet beach“, due to its soft sand. Many restaurants along the seafront offer unforgettable evenings and delicious seafood. Loreto is famous for the Basilica of the Holy House, one of the most important and ancient places of Marian pilgrimage in the Catholic world that reach the Basilica to visit the House of Mary. Tradition said that the small residence of the Virgin Mary was in Nazareth, where she was born, grew, where the announcement of the Archangel Gabriel took place and where she lived until her wedding with Joseph. According to tradition, some angels took the Holy House and took it off to Loreto, around which the Basilica was built. This park is the ”green heart” of the Marche region. The largest regional protected area includes the Frasassi caves. The park offers the possibility of excursions in its many paths. Interesting natural phenomena such as the presence of sulfur springs. 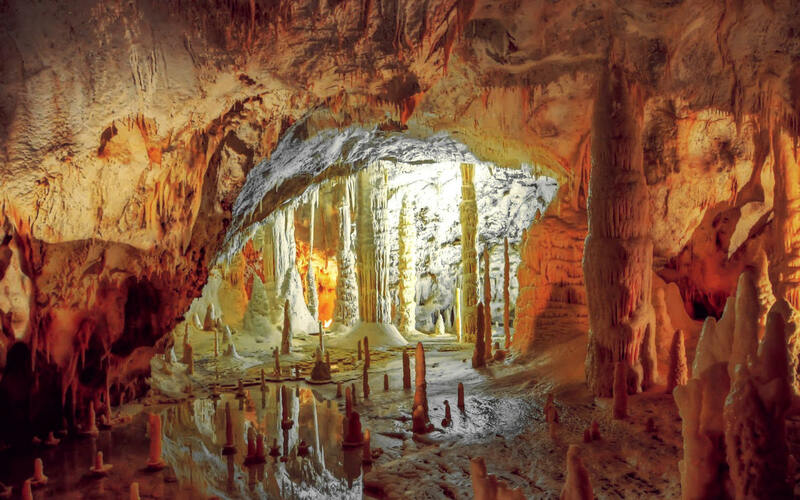 Fascinating underground karst caves, among the most important in Europe, discovered in 1971. We recommend a visit inside: the tourist route is easy to access, lasts just over an hour, and the temperature is constant at 14 degrees. In addition to its typical medieval historical center, Macerata is famous for its Sferisterio, an open-air arena known for its summer lyric season. In addition to the beautiful beaches, the Marche region also offers an interesting proposal of water parks. For example the Acquaparco Verde Azzurro in Cingoli and the Acquaparco Eldorado in Apiro which are about 40 km from Monte San Vito. Not only water parks but also adventure parks, in Cingoli and Genga. The Marche region is the home of made-in-Italy shoes, with the production of the most prestigious fashion brands of Italy’s fashion. In Civitanova Marche (40 minutes from Monte San Vito) you will find several outlets and factory stores. A visit to the weekly markets is always a good experience. For example, visit the Chiaravalle market (every Friday) 5 minutes from Monte San Vito. You can reach Rome by train in about 2 and a half hours, and spend an unforgettable day in one of the richest cities in history in the world. We can help you with booking train tickets.